The current frenzy of split-up activity is just the circle of life in the food & beverage industry. Neil Sedaka may have thought "Breaking up is hard to do" (1962) but food & beverage companies apparently don't agree. That's probably the headline right now for the financial side of the business, and one of the key points in our 37th annual Top 100© report. I can't recall a period where so many companies felt the need to break into two or more pieces. Maybe we should have seen this coming. "Bigger is better" may seem like an aphorism, but when you try to manage alcoholic spirits and kitchen faucets, you've got to wonder where are the synergies. Even U.S. processed meats and European coffee brands is a stretch. Surprisingly, apparently so is American grocery brands and international snack foods. In chronological order, I'm referring above to Fortune Brands (already Beam Inc. in the food & beverage world), Sara Lee (which already is no more) and Kraft Foods – which, just as we went to press, announced Oct. 1 will be the date for its split into Kraft Foods Group and Mondelez International. This time last year, when Kraft first mentioned plans for a split, I remarked in print how it sounded like Kraft General Foods and Nabisco all over again. The names, details and motivations of the current frenzy are different, of course, but the whole philosophy does take me back to historic moments in the food industry. This circle of life, death and rebirth is nothing new. 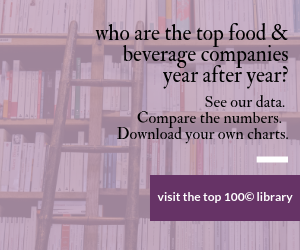 I looked back at our 1982 Top 100, and the first name on the list was General Foods Corp. Followed by Dart & Kraft Inc. Followed by Beatrice Foods. Skip No. 4 (Coca-Cola is still around) and you have Nabisco Brands, IBP Inc. (PepsiCo at No. 7), Ralston Purina, CPC International and United Brands. A little further down: Consolidated Foods (No. 14), Philip Morris (15), Borden (16) and Carnation Co. (18). And that's only 20 years ago. Borden was an interesting case study in its day. In the go-go 1980s, diversification was supposed to shield a company from a downturn in one product category. But how does a company with a dairy background manage businesses in wallpaper, Krazy Glue and chemicals? Interestingly, the Borden name returned to our Top 100 last year when Mexican dairy Lala renamed its American opeations after their leading (acquired) brand name. The circle of life, little Simba, continues. A few years back, Sara Lee looked similarly disheveled. Kiwi shoe polish and Hanes underwear? Household cleaners and body care. European laundry detergents. See the synergies? There weren't any. By the way, that Consolidated Foods Corp. I mentioned a few paragraphs back was a former name for Sara Lee. We bid good luck to Hillshire Brands, the company's new and focused name. Please stick with the food. The circle of life also continues with pure, homegrown innovation. Agro-Farma Inc., better known by its Greek yogurt brand name Chobani, cracks our list for the first time. Last year, the newbies were AdvancePierre Foods and Diamond Foods. Not too long ago, the newcomers were B&G Foods, Hain Celestial and Pinnacle Foods. Next year, Post Foods will appear on our list, thanks to the Ralcorp split. This is a good time for me to direct you to the online-only components of our Top 100. We have a truly remarkable tool at www.foodprocessing.com/top100.